procedure of the extraction and purification of the drinking water. Atmospheris air water generator or AWG are ideal for the work camps, expeditions, offices, factories, military bases and also during any kind of emergency and disaster relif. In the recent times, large number of air water generators has been planned for various NGOs and resorts for the irrigatioanl and reservior purposes. The quality of drinking water in the air water generator are being carefully passed through the loboratory test and have exceeded all the international quality standard markets. Established to serve better resources, Aquagen banks on its sophisticated purification proce-dures that are undertaken by the company and that in turn ensure unsparalleled solution for the human consumption. There is scarcity of water in many parts of the earth and air water generators are perfect for the water contaminated areas. The company just requires electricity through which they can provide a decentralized , local source of clean drinkable water without any connection to pipes or catch basins. The air water generators are mostly popular in Africa, Middle and Far East and they are planning to extend their network to South America, Australia and South Asia. Airowater provide an affordable, cost-effective solution of retrieving water from the environment and high-end purification. Airwater units can be installed easily and quickly. Airowater units are environment - friendly and safe for use. 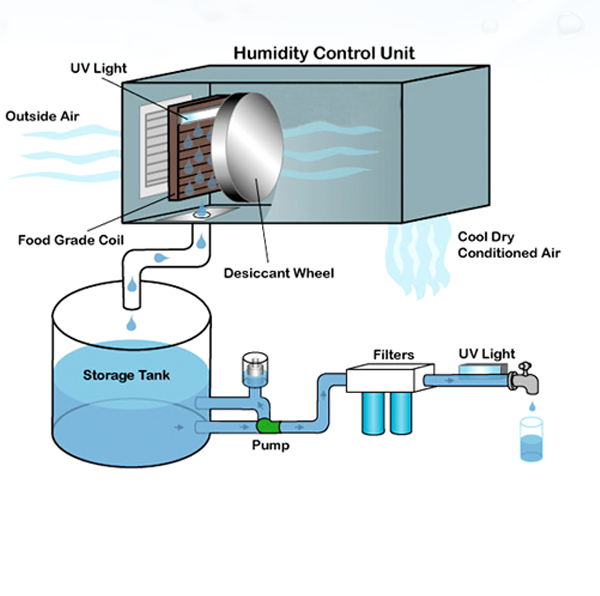 Airowater units provide a reliable water storage and cooling systeam.